I really enjoyed working with Carrie and Brian and the fun they had on their wedding day was fantastic. 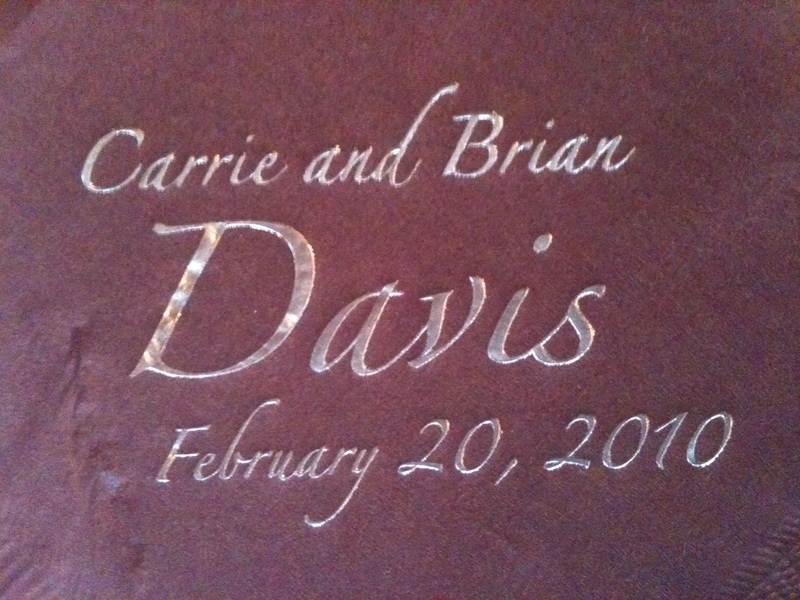 Carrie and Brian met with me over a year ago while in my shared office space with Simply Elegant Weddings. 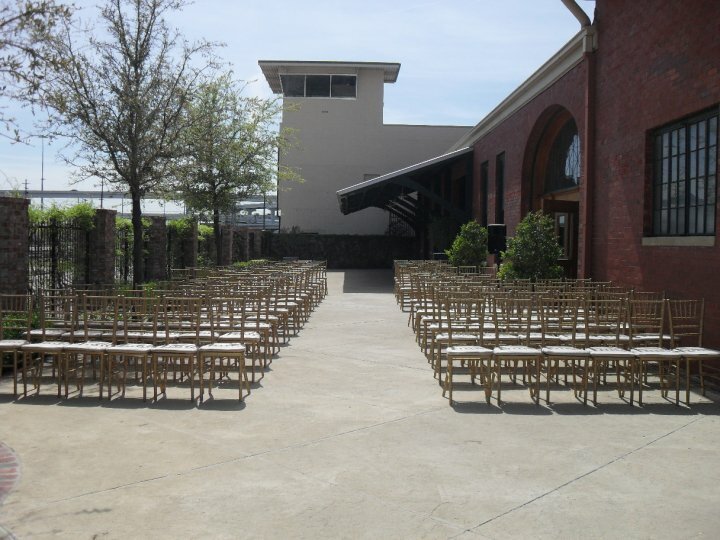 At first I was only hired to entertain their wedding guests, but as a few months went by I was asked to help with planning some of the details. Now Carrie is and was like most Bride’s today, she was very organized with everything that she had got together,but she was a hard-working professional with little time to invest in getting information together and circulate all the details of her big day with all the vendors involved in making that day so special. I could tell how much stress was removed once she hired me to help with the plans, and that’s always a good thing! Now Carrie and Brian didn’t want a huge wedding, and at first Carrie didn’t want to have a ceremony; however, her mother insisted that they have just a simple family ceremony. I think this was the point at which Carrie decided that she no longer had time to manage the details, which thankfully was a lot sooner in the whole process than most. 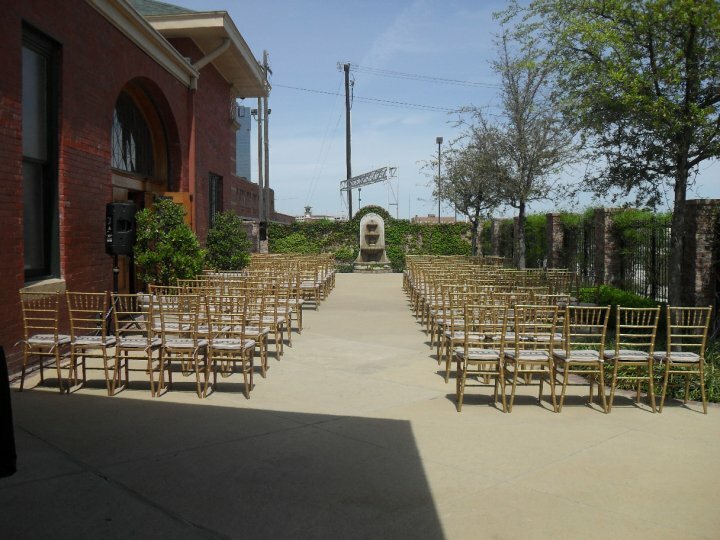 Carrie and Brian decided to have their wedding at the YWCA in downtown Fort Worth, which is a beautiful facility for wedding ceremonies and receptions. The YWCA has a pleasant staff that was always eager to help and as a vendor with special parking needs it was awesome to be able to park on site without trying to find a garage with enough height that I could get into with the trailer. 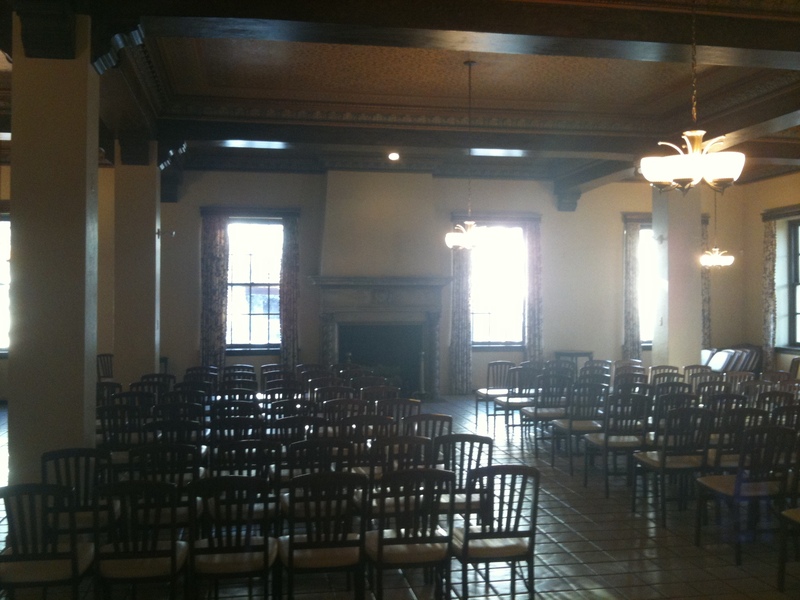 I am a huge fan of the rustic old style decor of the YWCA and the ballroom reminds me of the majestic glamour of the 1920’s. Just a beautiful canvas on which to build a beautiful ballroom. 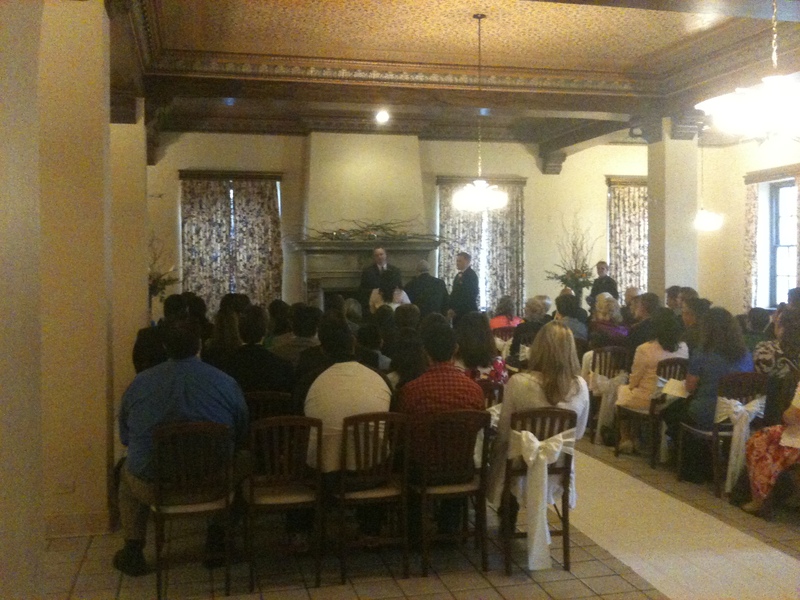 We staged the ceremony downstairs and used the oversized fireplace as our backdrop. With the solo Cellist, Louanne Greer playing classical pieces along with specially arranged selections such from the Beatles and “Stand By Me” the ceremony setting was magical. Christie Greer of Simply Elegant (no relation to Louanne) provided the gorgeous flowers and centerpieces which consisted of tulips, callalillies, and other branches arranged in tall glass vases. They were the perfect touch to the decor and really highlighted the elegant sophistication of the venue. 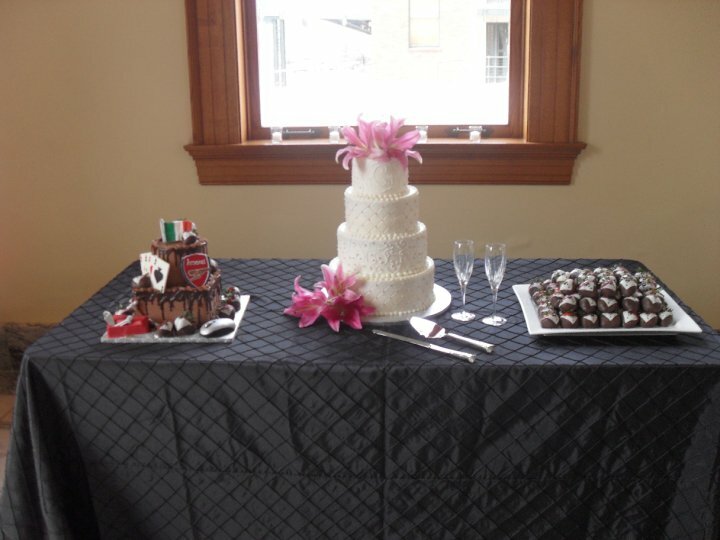 The Grand Ballroom was decorated with chocolate linens and a light cocoa table runner. The Ceremony was very intimate with only 60 of Carrie and Brian’s family and friends; however, the reception was nearly overflowing with 220 people ready to celebrate with this happy couple. 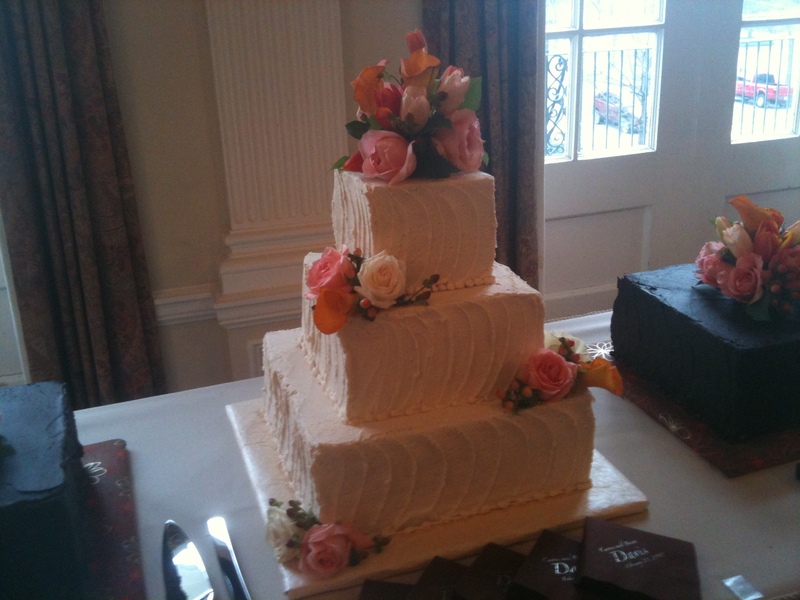 Now Carrie’s big thing was the cake which was baked by Creme De La Creme in Fort Worth. 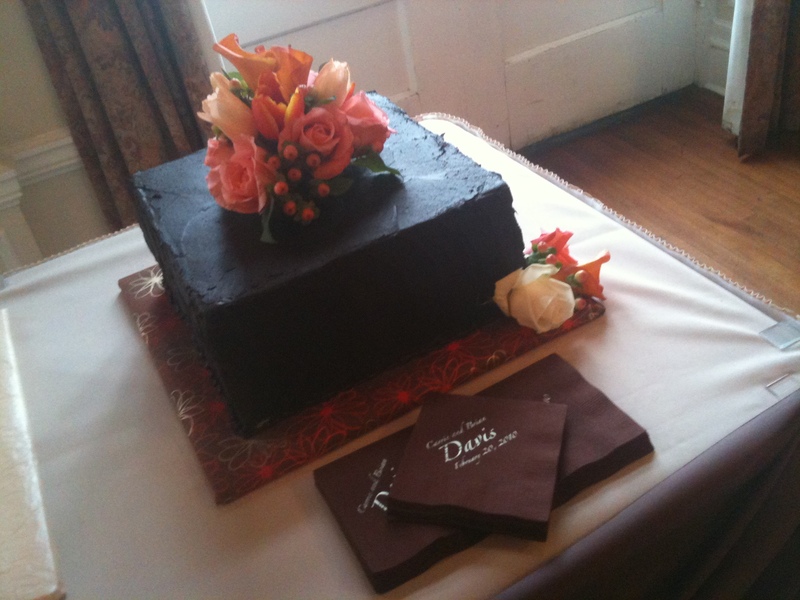 Each layer of her cake was a completely different flavor, each balanced in sweetness and flavor. 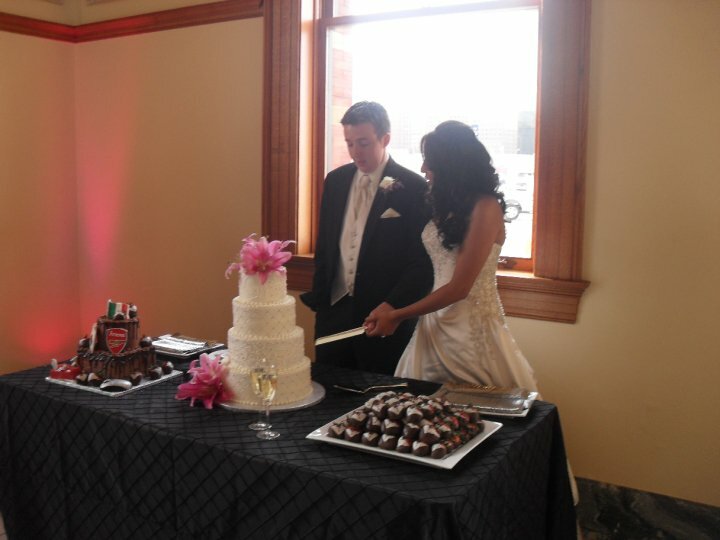 And, like usual, Creme De La Creme did an amazing job…I love their cakes. After the ceremony, we began cocktail hour while the photographers had family pictures downstairs and while the additional guests arrived for the reception. Since the ceremony started at 4pm, we had a family cocktail hour from 4:30pm to 5:30pm and started receiving guests after that. The reception didn’t start until 6:30pm so we had a lot of free time leading into the actual reception, nonetheless, we kept a light-hearted atmosphere and a very family oriented cocktail hour. As the reception began I introduced Carrie and Brian to a very unique version of “Can’t Help Falling In Love” by a group called Lick The Tins. I would call it a Celtic twist on a great original…which matched these two perfectly. 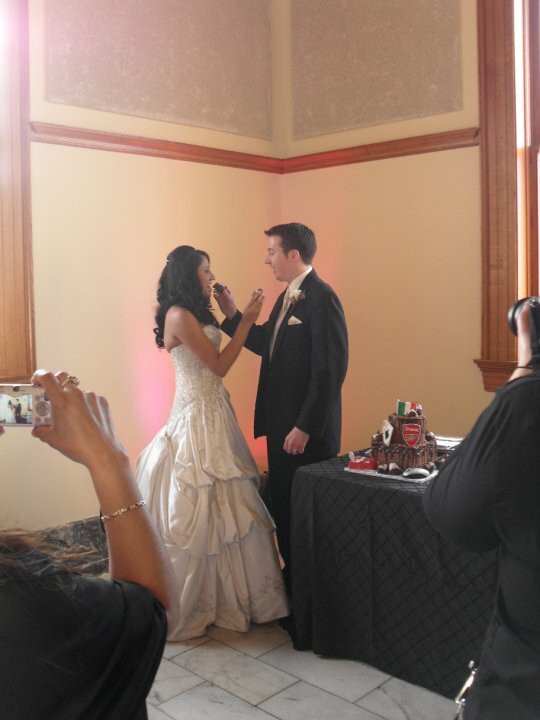 Their first dance was to one of my favorite songs “I could Fall In Love” by Selena. There wasn’t a large agenda for the night as Carrie and Brian opted to keep it very simple The toasts where fantastic as long time friends gave their stories from years past and Carrie’s father was introduced to the microphone with thunderous applause. He was a man of few words but with a huge heart. Once we began dancing it never really ended as we mixed across a fun span of time as Carrie and Brian were huge fan’s of 80’s pop. It was really fun to mix from 80’s to Latin Reggaeton to a little Motown and funk. At the end of the night guests were having so much fun they didn’t even realize that Carrie and Brian snuck out the back door early to prepare for their long morning flight.